Download now the award-winning F-Secure SAFE to 3 devices of your choice, absolutely free for 6 months and with no commitment! Fill in the "Customer Code" found on your Fixed & Internet invoice and your e-mail & download F-Secure SAFE*. * Valid for Fixed Telephony & Internet customers. We take care of your e-life and offer you the award-winning F-Secure SAFE Internet Security absolutely free for 6 months. Only WIND offers absolutely free for 6 months and with no commitments, the awarded multi device Internet Security for your PC, Mac, Smartphone and Tablet, F-Secure SAFE, worth €29.90. With F-Secure SAFE, you can handle your everyday on line activities on any device. Shop on line and use web banking services completely worry-free. 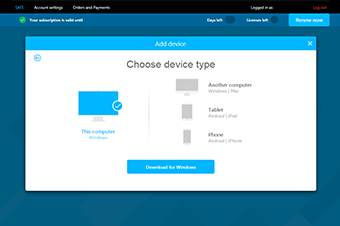 For installation directly to your current device, select installation on current device. Otherwise, see how to install on another PC, Smartphone or Tablet through e-mail or SMS. 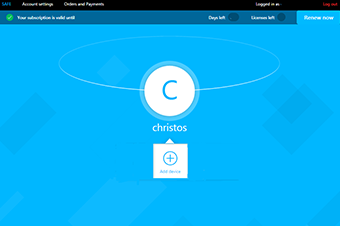 You can also invite other users to your F-Secure circle and they can protect their devices using your licenses. 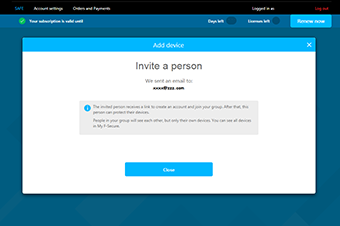 The invited users will be provided with an account where they can manage their devices. For installation upon your registration at "My F-Secure" click “Add device”. 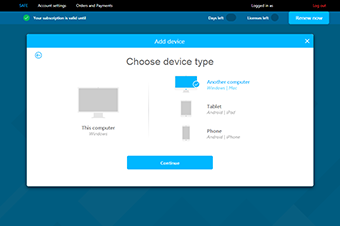 Choose “My device” in order to install F-secure for yourself and click “Continue”. Choose “This computer” in order to install the F-secure to the pc you are using at the time. Press “Download for Windows”. If you are using another operation system, don’t worry, my.F-secure will recognize it and will download the relevant executable file. 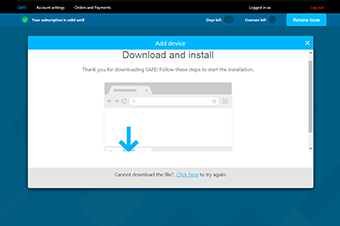 Install the downloaded file by following the instructions step by step and complete the installation of F-Secure. 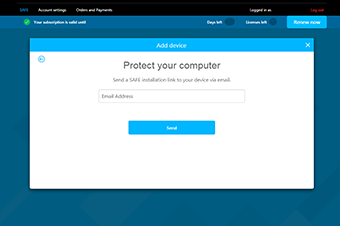 The product cannot be installed on a computer that uses other antivirus or firewall products. The product detects and removes most of the conflicting security and firewall software products automatically during installation. However, new versions of security products are coming up all the time and because of this it takes time for F-Secure to react and support the uninstallation of all of them. This is why we recommend removing manually other security or firewall software before installation. 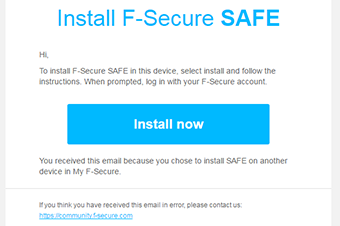 To download the installer to another computer by email, log in to "My F-Secure", select “Add device”, then choose “ My device” and finally press “Continue”. Choose the device’s type and then press “Continue”. If it is a tablet or a mobile then choose the email option, otherwise if you have chosen “Another pc”, there is only the email option as seen below. Type your email and press “Send”. A message appears informing that an email with a link was send. Go to your e-mail on the device where you want to install it and click "Install Now". Follow the instructions step by step in order to complete the installation. 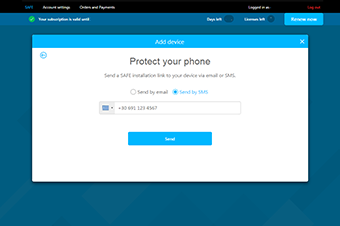 To download the installer to another computer by SMS, log in to "My F-Secure", select “Add device”, then choose “ My device” and finally press “Continue”. Choose the device’s type and then press “Continue”. Choose "Send by sms", type your mobile number starting with Greek country code (+30) and press "Send". (Alternatively choose from the drop down menu “Greece” and the country code +30 will be inserted automatically). Option valid only for devices with SIM card. Soon you will receive an SMS. Open the SMS, and click to the link. In the new page opened click to “Install from app store” to be redirected to Google Play store. Click “INSTALL” in order to install your personalized app. 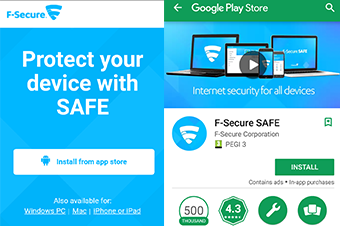 Install the app (as usual, like all apps) and you are now protected with F-secure! 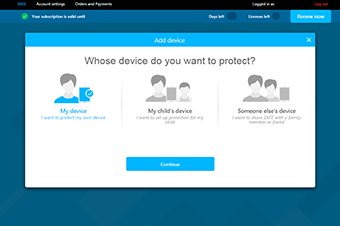 To add a new user to the service, log in to "My F-Secure" and select “Add device”. Choose “Someone else’s device” and press “Continue”. Fill the name and the email of the user you want to invite to your service and select “Send Invitation”. The person you add will receive an invitation email to download the service in one device using your license. 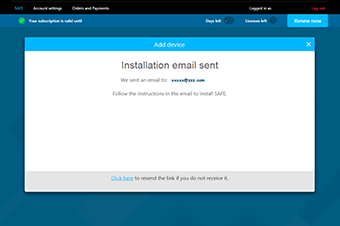 A message appears informing that the user you have invited will receive an email with a link to the F-Secure SAFE installer. Don’t forget that you can remove this user at any time. The user you have invited will receive an email. He has to confirm the account and then to press “Start now” in order to install the F-secure following the instructions. In the same email he can also find his username and password in order to sign in to "My F-Secure". Which WIND services are eligible to F-Secure SAFE absolutely for free? Commercial available and unavailable Fixed Telephony & Internet tariff plans and combined WIND services: WIND triple play, WIND triple play 2, WIND triple play 3, WIND ONE Unlimited GB, WIND ONE 50Mbps Unlimited GB, WIND ONE 100Mbps Unlimited GB, WIND ONE 200Mbps Unlimited GB, WIND ONE 5GB, WIND ONE 50Mbps 5GB, WIND ONE 100Mbps 5GB, WIND ONE 200Mbps 5GB, WIND ONE 2GB, WIND ONE 50Mbps 2GB, WIND ONE 100Mbps 2GB, WIND Double Play, WIND Double Play L, WIND Double Play M, WIND Double Play S & WIND Broadband, WIND One, WIND One XL, WIND One L, WIND One M, W+σταθερή, WIND Business Double Play, Business Double Play, Business Double Play Basic, SIMPLEfi, SIMPLEfi 2, SIMPLEfi Busienss, SIMPLEfi Business 2, WIND Fiber 200 Plus, WIND Fiber 100 Plus, WIND Double Play 50 Plus, WIND Double Play Plus, WIND Fiber 100, WIND Double Play 50, WIND Double Play Basic, WIND Broadband 50, WIND Broadband Basic, WIND Triple Play 24, WIND Triple Play 50, WIND Triple Play 100, WIND Triple Play 200, WIND Triple Play 2 24, WIND Triple Play 2 50, WIND Triple Play 2 100, WIND Triple Play 3 24, WIND Triple Play 3 50, WIND Business Fiber 200, WIND Business Fiber 100, WIND Business Double Play 50, WIND Business Double Play Basic. For how long can I download F-Secure SAFE for free? 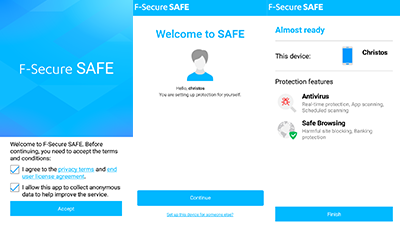 You can download F-Secure SAFE for free and without any additional commitment for 6 months. I already have an eligible WIND tariff plan, can I get F-Secure SAFE Internet Security absolutely free for 6 months? Of course. The existing customers of the eligible tariff plans can make use of this unique gift. The gift is available for a unique activation so if you have activated it once you can’t reactivate it. Do I have any commitment upon expiration of the free of charge months? The free of charge subscription period is offered with no commitment. When the period ends, if you’re happy with the service, you can keep it for just €29.90/year from €59.90/year. That’s a 50% massive saving. The gift is eligible for a unique activation per customer. If you have already activated it and you want to extend the validity, you can renew it in the special price of 29,90€/year instead of 59,90€/year. If you have never activated it, you can do it at any time. How can I install F-Secure SAFE? Simply follow the installation steps. If you need further assistance to install F-Secure SAFE please contact WIND customer service at 13800 or at 800 5001277 if you are a business customer. Alternatively you can visit F-Secure support in English. How many devices can I protect free of charge? With the F-Secure SAFE code you will get absolutely for free, you can protect up to 3 devices of your choice (Windows, Mac, Android, iOS, Windows Phone 8). The minimum system requirements for F-Secure SAFE are available at F-Secure SAFE site. Can I install F-Secure SAFE with my existing security software? F-Secure SAFE is a complete security program and running several security applications is not recommended as it can affect the performance of your computer and cause conflicts. During installation, F-Secure SAFE will look for conflicting or older security software programs running on your machine and will prompt you to remove them. How can I check in which devices I have installed F-Secure SAFE? 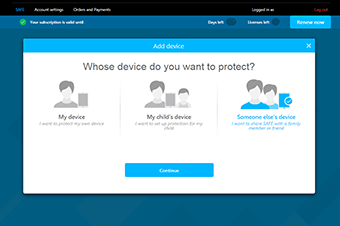 Log in to My F-Secure portal and check on how many devices you have installed your F-Secure SAFE or install it to any other device of your choice. Can I move an F-Secure SAFE subscription to another device? Yes you can move your F-Secure SAFE subscription to another device, be it a PC, Mac, Smartphone or Tablet. You can do this by logging in to My F-Secure portal, uninstall from the previous device and then re-install on the new one. Can I transfer an F-Secure SAFE subscription to another user? 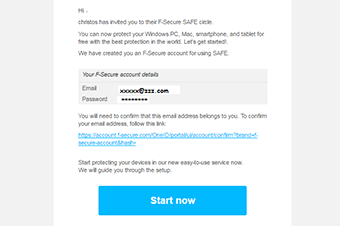 Yes you can invite other users to your F-Secure circle so they can protect their devices using one of your available licenses. 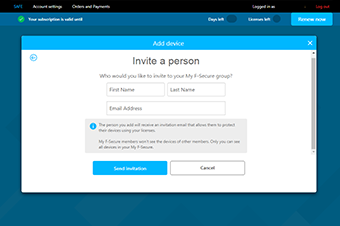 The invited user will be provided with an account where he can manage his device without having access to your My F-Secure portal. I have already F-Secure SAFE installed in my PC. Can I get the free of charge months that WIND offers me? If you already have F-Secure SAFE you cannot have the free months we offer. Who can I contact for support on F-Secure SAFE? If you need assistance to install F-Secure SAFE please contact WIND customer service at 13800 or at 800 5001277 if you are a business customer. 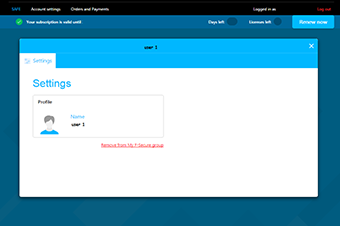 For technical issues, please visit F-Secure SAFE support site in English. I have already downloaded F-Secure SAFE in my devices, where can I find more information? Visit F-Secure SAFE help center where you will find detailed information on using the product. 1. 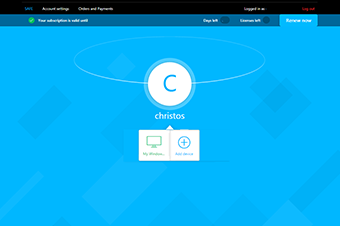 Make sure you have typed correctly the customer code (link στo tab «Get it now») and that you have successfully registered at F-Secure SAFE. 2. Make sure your device meets the minimum relevant system requirements. Check F-Secure SAFE minimum system requirements. 3. Although upon installation, F-Secure SAFE will prompt you to remove older security software programs, make sure you do not have any other security software on your device as this could conflict with F-Secure SAFE. 4. There may have been an issue during installation. Try uninstalling and re-installing F-Secure SAFE on your device. If you are unable to resolve an issue yourself, please visit F-Secure SAFE support site. Is F-Secure SAFE slowing my computer or smart-device down? F-Secure SAFE uses the latest DeepGuard technology to keep you proactively protected against all the latest threats using minimal system resources. As a result you will experience very minimal impact on your systems performance. However, if you’re experiencing slow performance while using F-Secure SAFE you should make sure your computer or device meets the minimum system requirements, or ideally the recommended specification. For more details check F-Secure SAFE minimum system requirements. Is F-Secure SAFE stopping me from connecting to the Internet? If you are having issues accessing some websites, this could be due to your parental control settings. If you open up F-Secure SAFE on your device you can go to settings and then adjust your Parental Control settings accordingly. How do I uninstall F-Secure SAFE from my PC? 1. Open up the Start menu on your PC and select "Control Panel". 2. Select Add/Remove programs and select all files relating to F-Secure SAFE. 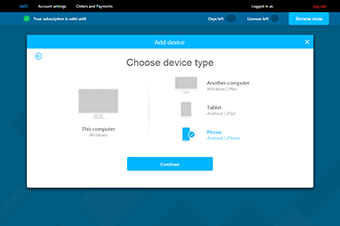 Upon uninstalling, log in to My F-Secure portal and remove the devices so to download F-Secure SAFE to a new one. How do I uninstall F-Secure SAFE from my Mac? 1. Click “Applications”. This will display a list of all the installed programs on your Mac. 2. Click F-Secure SAFE folder and then select “Move to trash” or select “Uninstall F-Secure SAFE”. The first option requires that you empty the “Trash”. How do I uninstall F-Secure SAFE from my Android? In your device's Settings menu select Apps or Application manager (this may differ depending on your device), tap the app you’d like to uninstall. Then select Uninstall. How do I uninstall F-Secure SAFE from iOS? Hold down the F-Secure SAFE logo and tap the cross to remove the app.